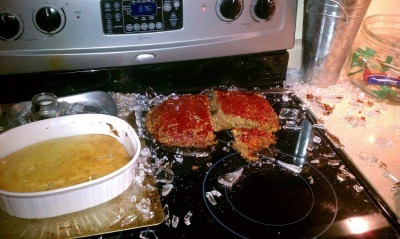 I've used glass bakeware for years, but I recently learned about increasing incidents of exploding glass while cooking. I first heard about exploding Pyrex, and other exploding glass dishes, from a Tweet, of all things, and then I read the article about it. Hat tip to Katie from La Jolla Mom for bringing it to my attention first. Next, I really sat up and took notice when I was warned about it again, this time by Consumer Reports. You see, I was so interested in this news not only because I use Pyrex dishes in my oven frequently, but also because I myself experienced an exploding glass incident when I was a kid. The short version of the story was that I was melting crayons to have colored wax for a craft project for school, without parental supervision. I don't think it was my parent's fault they weren't supervising me. Instead, I just didn't "think" to tell them what I was doing, and they I guess didn't know I was as dumb as I apparently was. Being completely ignorant I put a glass mixing bowl, like those Pyrex ones almost everyone has, onto a stove top filled with bits of crayon, to heat it up. Needless to say it shattered, made a huge mess, scared me and my parents to death, and I was told over and over again why that was a dumb idea. No physical injuries occurred, but I saw the potential for danger and the incident has stuck out in my mind. 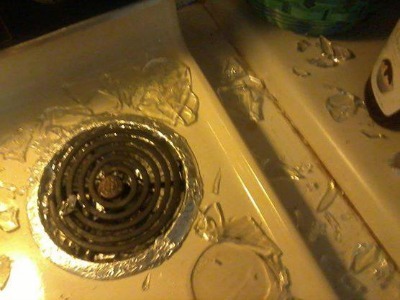 The scientific reason that the glass mixing bowl on the stove exploded and shattered is a term called "thermal shock," which is what happens when glass (or ceramic) gets a sudden and rapid temperature change and cracks, sometimes with explosive force. Some glasses are better at resisting thermal shock than others. One of those glasses is called "borosilicate glass," which is what Pyrex glass bakeware used to be made of. However, it has changed its formula now, at least in the United States, and is instead made with tempered soda lime glass. As far as I can tell there were no visual changes to the look of glass bakeware as a result of this change in formula. Further, the companies that manufacture these products, the two biggest of which are Pyrex and Anchor Hocking, say the change also did not change the bakeware's resistance to thermal shock. 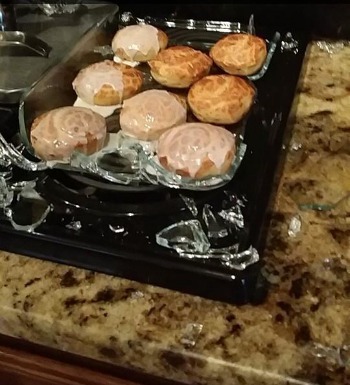 However, there is evidence, which I'll discuss below, that borosilicate glass is more resistant to thermal shock than the newer soda lime glass, which means these incidents of exploding glass bakeware may be on the rise. Below is a video created by Consumer Reports which conducted a year long investigation into exploding glass bakeware. I learned many things from this video, but I think the thing that made the biggest impact is glass explosions can be dangerous, and very dramatically scary. See how the tester runs away, even with all the protective clothing, when they put the glass dish down on the counter. Along with this video Consumer Reports also wrote an article for its January 2011 magazine about the issue. I subscribe to the magazine, and have read it. Basically, what I have taken away from both the video and magazine article is that Pyrex, like any glass bakeware, is not as indestructible and safe as I thought (or hoped) it was. 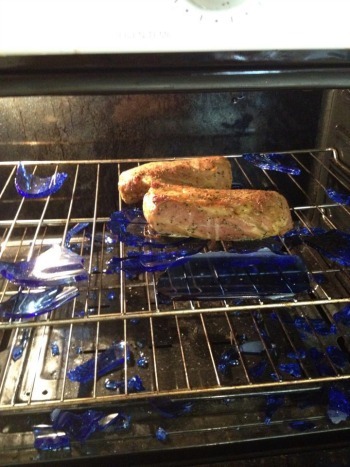 Further, the explosions of this glassware that are shown in the video happen quite quickly, and without warning, and although Consumer Reports admits that the tests purposefully, and to an extreme, disregarded the warnings on the labels of the bakeware, I myself could foresee that people could use the items in just such a way. 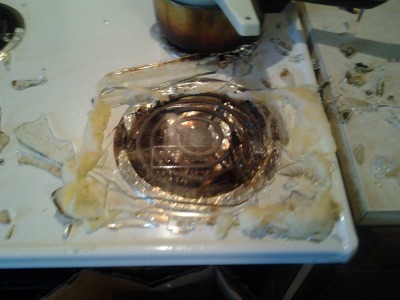 Finally, what is really distrubing to me, and is not really mentioned in the video much, is that a lot of the exploding hot glass bakeware didn't explode when it was placed on a cold counter, but instead while it was still in the oven! According to a statistic within the Consumer Reports magazine article, 55% of the 163 incidents they analyzed occurred inside the oven itself. The manufacturers of these glass baking dishes have responded to all the recent criticism, saying that these people that were injured were not following the directions on the packaging properly. Even Consumer Reports admits that the testing they did, which caused the glass explosions, didn't follow the safety instructions on the packaging. I, for one, don't generally read the very small print on my cookware, and I definitely know I didn't even have a chance for the glass bakeware I inherited from my mother and grandmother. However, it made me realize I should read the instructions now. Below I will summarize the safety rules I've gleaned from several sources, including this one, about using glass bakeware. Is This Plain Misuse Or Foreseeable Misuse? As a lawyer myself I know what I did when I caused the mixing bowl to shatter was called "misuse." I agree, it was misuse, and no one was to blame for that but my own stupidity. When someone uses a product improperly, and in a way not intended, lawyers use the legal defense of "misuse," saying the person injured or harmed has no one to blame but themself, that it is their own fault, basically, that something bad happened. An obvious example of misuse would include using a blender to clip your fingernails. If you cut your fingers severely you have no one else to blame. That was just plain stupid, and a misuse of a blender. On the other hand, a defense to the defense of misuse is something called "foreseeable misuse." Foreseeable misuse is basically the idea that someone is not using the product in the way it was intended, but manufacturers should have foreseen that people would use it that way anyway, and therefore should have made it in a way to avoid this danger. An example of this is brightly colored cleaning products. To children these products may look like "juice" and drink them if given the chance. Therefore, these cleaning products should have child proof caps to prevent this. There is, at least in my mind, an argument that the shattering events which have been reported are foreseeable misuse. I especially believe this for the times that the product reportedly exploded while it was in the oven, or those events which happened supposedly because there was a scratch in the glass. That is just my personal opinion though. 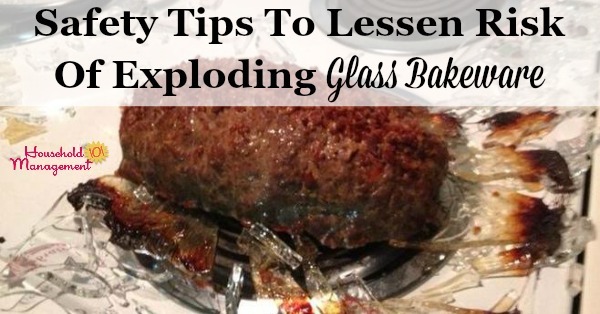 However, no matter whether these things happen because the glass bakeware is being misused or not, here are some safety tips we should all use to reduce the risk of this happening to us. These tips are summarized from both the advice of Consumer Reports and the manufacturer's directions. Preheat your oven completely before you put the glassware into it. Never cook meat or vegetables in the glassware without also adding some type of liquid to the bottom of the dish first. This liquid should be added before the glassware is heated though, and not to hot glassware because the addition of the liquid later can cause thermal shock. When taking hot glassware out of the oven place it onto a dry (definitely not wet) towel or potholder, and never directly onto a cold or wet surface. Examples of cold or wet surfaces can include directly placing it on your countertop or into your sink. 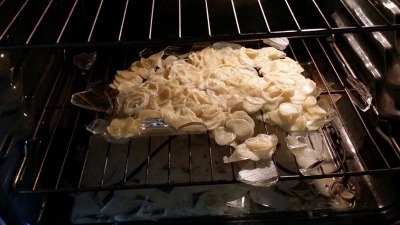 Never move glass bakeware directly from the freezer to the oven, or vice versa. Please, those of us who make freezer meals, remember this one! Know that chips, cracks and even scratches in the surface of your glass bakeware can make the results of thermal shock more significant, or dangerous. 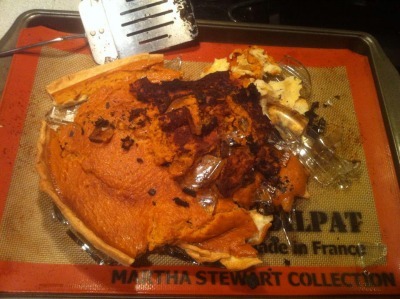 Therefore, you use such damaged baking dishes at your own risk. "We've had it happen to us. 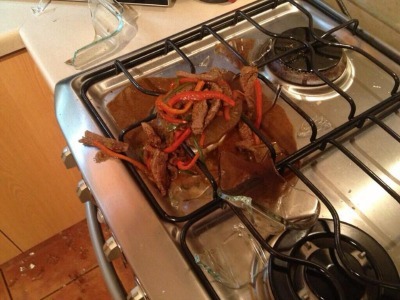 Keeping fajita fillings warm in the oven, took it out and placed it on top of the stove, which wasn't on, and it exploded everywhere (new Pyrex). Luckily no one was hurt. We've now binned all our Pyrex stuff & use ceramic ovenware instead." 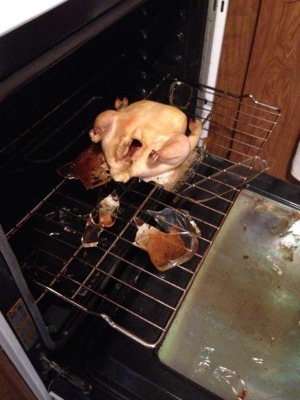 "I poured a half cup of warm water in my chicken and glass exploded everywhere. This was my favorite baking dish of 15 years for cakes. I will stick to the crockpot for chickens and will opt out of Pyrex all together unless its for a fruit salad!" 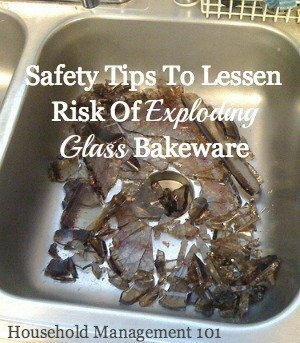 I hope this information has helped make you aware of this issue, and that each of you will make an informed and safe choice about whether you will continue to use glass bakeware, and if so, be more careful in how you do use it. 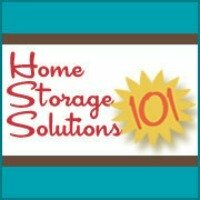 I know I've learned a lot, and will be implementing these safety tips right away! 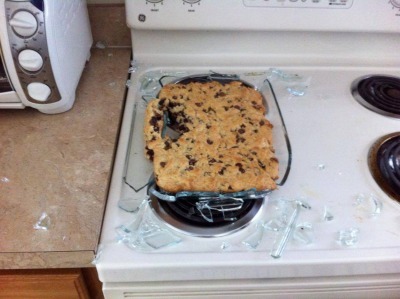 "This was not on a baking sheet during the explosion. It was baking above another pie, so both were ruined. Tragic." 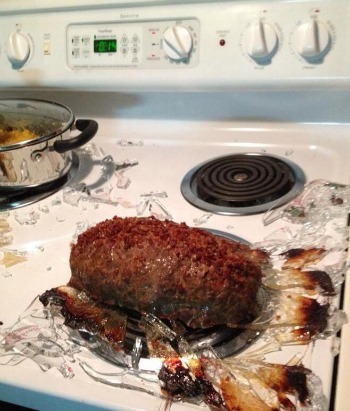 "I was cooking pork tenderloin.... ;(. We went out to eat that night needless to say!" "I had the same happen to me. 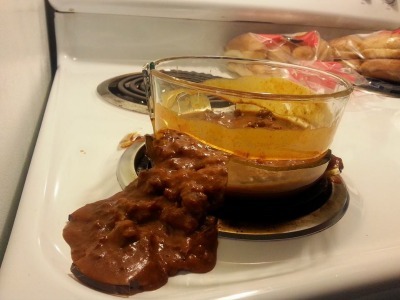 Pulled pork tenderloin out of oven and added warm broth to pick up the bits and it exploded. The worst part is I was on bed rest for broken ribs and I couldn't even clean it up." 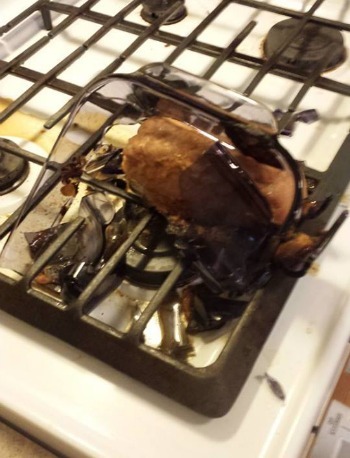 "Here is my LAST aftermath of the exploding pyrex... have not used glass to cook in since August 2011..."
"The last pyrex dish I will ever use." "This happened to me but it was because my back burner was on accidently."